We’re about to ring in the New Year — and the best way to do it is with bubbles. But which bottle of bubbles to choose? First, if you aren’t already aware, Champagne is a type of sparkling wine, but not all sparkling wine can be called “Champagne.” Actually, that’s not entirely true — there are a handful of American wineries that are allowed to put “champagne” on the label. How to know whether it’s American “champagne” or the real thing? Here’s the hard and fast rule of thumb: if the full-size (750ml) bottle costs less than $20, and/or the label says “Korbel,” it’s American. Now, that doesn’t mean there’s anything wrong with American “champagne,” nor does it necessarily mean you won’t like it — just be aware that what you’re buying is not from France. With that out of the way, let’s get an understanding on how to buy a bottle of Champagne (from France). If you’re not an avid drinker of “real” Champagne, or don’t know much about it, you may want to put your money toward another type of sparkler — you’ll likely be able to buy multiple bottles for the same you’d spend on one bottle of Champagne from France. However, if you’re only planning on buying one bottle, and are budgeting at least $30 for it, then go ahead and try some of the real stuff! Champagne labels look confusing, but are actually very helpful in letting you know what’s inside the bottle. Number one, it’s either going to be a “vintage” — meaning all the grapes came from the harvest of a specific year, or “non-vintage” (often abbreviated as “NV”), which means the wine is a blend of several different years. Generally speaking, non-vintage Champagne from a particular “house” (a.k.a. “winery” or “brand”) will cost less than the house’s vintage offering. Which is better? Most snobs will tell you that a vintage-dated Champagne is going to be more complex. However, the nice snobs will tell you that the non-vintage represents the “house style” and can be counted on to have a consistent taste profile. In other words, which is “better” is subjective. If you’re purchasing the bottle as a gift for a wine aficionado, the vintage-dated Champagne will be more impressive. Brut Nature – completely dry, with no sweetness whatsoever. Extra Brut – pretty darn dry, with anywhere from 0 to 6 grams per liter (g/L) residual sugar. Brut – dry, but with just enough sweetness to be palatable for people who enjoy dry white wines. This is the type you’ll see most often in wine shops. 5-15 g/L residual sugar, for those who know what that means. Extra Dry – 12-20 g/L residual sugar, which means it’s going to be a bit sweeter than Brut. Dry/Sec – 17-35 g/L residual sugar. It’s much sweeter than Brut. You’re unlikely to find it in the USA, except at specialty wine shops. Demi-sec – 35-50g/liter residual sugar. It’s sweet, but Champagne has enough acidity to balance out the sweetness and so it’s still palatable — and quite enjoyable with desserts. Doux – at 50+ g/L sugar, this is the sweetest Champagne of all. You likely won’t see it in the USA, but in case you do, know that it is exceptionally sweet. 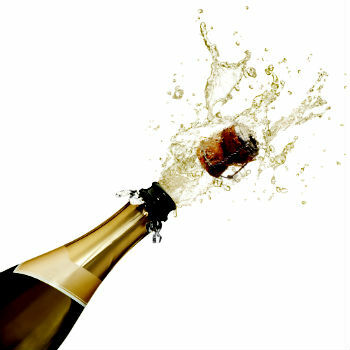 Most people enjoy either Brut or Extra Dry Champagne, and Brut tends to be the style that is most easily found. Now that you know the difference between vintage and non-vintage, and know the various sweetness/dryness levels of Champagne, what else can help you make the right decision in purchasing a bottle? Well, now it’s a matter of choosing the “house” or winery (or brand). How to choose? Really, there’s no formula — it’s all a matter of taste. For 90% of the population, it won’t make too much of a difference which house/winery/brand you choose. However, the 10% of the population who fashion themselves as Champagne connoisseurs may prefer one house over another — if you are in that group, please let us know in the comments which Champagne house(s) you most enjoy, and why. As for the rest of you, feel free to explore. Some houses tend to have a lighter style, others richer, some more toasty, while others more buttery — which one you like is a matter of personal taste, and you won’t know your favorite until you try several. As for reliable names to look for, consider Billecart-Salmon, Bruno Paillard, Gosset, Henriot, Deutz, Salon, Krug, Pommery, Lanson, Mumm, Perrier-Jouet, Louis Roederer, Piper-Heidsieck, Charles Heidsieck, Heidsieck et Monopole (one of my favorites is “Blue Top” NV), Duval-Leroy, Bollinger, Taittainger, Nicolas Feuillatte, Laurent-Perrier, Moet et Chandon, Veuve-Clicquot, Ayala, Philipponnat, and Lenoble. Yes, that’s a long list, and there are several others, but it’s good to know that there are so many high-quality Champagnes available to you, isn’t it?